What’s More American Than Skydiving? When I quit my first real job, I didn’t have a plan. I just walked out with the recklessness of a Harvard graduate who had come of age during the Clinton era Internet bubble. I was barely out the door when reality set in, and elation gave way to doubts about the wobbling post-Y2K economy. What if I had doomed myself to poverty? I wanted catharsis. That’s when I got the idea to jump out of an airplane. Soon after, in a boozy haze at a San Francisco loft party, I recruited friends to skydive with me over the Russian River. Everyone sounded brave, but the next morning I was the only one who showed up. Instead of bowing out, I signed the paperwork. My senses felt dulled by a vortex of never-ending work and play, and I wondered what my inner voice would tell me about the path ahead if I could actually hear it. When we opened the door at 10,000 feet, the only thing I saw was blue. It was a threshold to air, to nothingness. I am scared of heights, but the blue was more abstract: the terror of the unknown. I hadn’t even told my parents I was going to jump. I dug in for a moment, heartbeat in my throat, reconsidering. The tandem instructor nudged me toward the edge like a reluctant sheep while telling me to pull back my head. I breathed deep, looked up, and, much to my surprise, found calm. Safety was supposed to be inside the plane, with a seatbelt on. But a deeper voice stirred, and it said: Maybe the places most enclosed—by walls, by rules—are the ones that pose the greatest danger. After all, isn’t that why I had quit my job? Outside was an uninhibited place, full of possibility. “Ready, set …” And we launched into the wind. My senses were overwhelmed by the relative wind at terminal velocity, a feeling not of falling but of flying. The parachute deployed with a big, decelerating tug. In the quiet peacefulness under the nylon canopy, floating thousands of feet above the sparkling river and green hills, I came home to myself. We reached the ground softly. My instructor high-fived me and said, “You could be good at this!” I was adrenalized to the gills, driving away well over the speed limit with the windows down, radio blasting, and dancing like a maniac. The following week, I started training for my first skydiving license. Sometimes I was so scared to jump that I prayed for high winds to keep me on the ground. Still, I kept showing up. Exiting through that door became a passion, an addiction, a ritual. I woke up early to go skydiving at tiny little airstrips surrounded by artichoke fields. People I would never have encountered in the Harvard bubble changed the way I thought about friendship. The drop zone was a magical equalizer, where trust fund kids with BMWs hung out with elevator technicians. Parachute packers living on ramen noodles schooled emergency room doctors in flying skills. There are skydivers all over the world, but the United States has the greatest numbers—our Parachute Association has around 35,000 members. We are a big country with a relatively free market for personal risk-taking and a high enough average income to put extreme sports within popular reach. The early history of sport skydiving is filled with innovations by both members of the military and pot-smoking, barefoot hippies. This reflects a cultural and socio-economic diversity that is rare in places where skydiving is more expensive, and therefore more exclusive. True, the sport’s pioneers were largely white and male, and skydiving remains demographically skewed that way. The culture is evolving to be more inclusive and welcoming to minorities (for whom daily life may seem to carry enough risk). No matter what they look like, the skydivers I’ve encountered in this country seem to share the core values of freedom, optimism, and exploration, all essential elements of the American character. Flying with high-performance canopy pilot Jessica Edgeington in a discipline the author pioneered called XRW (“Extreme Relative Work”). Advances in skill and technology have allowed a wingsuit flyer in freefall to match speeds with a pilot under a fully open parachute. About a year after I started jumping, I embraced my own desire for new frontiers. I sold most of my belongings and moved to South Africa to pursue my dream of a meaningful career researching the impacts of war and violence on marginalized communities. Taking my skydiving rig with me, I fell in love with the man who first drove me to the Johannesburg Skydiving Club. Freefall became an emotional choice. Eric, who became my life partner, was the chief instructor at the club and an early adopter of the new discipline of wingsuit flying. 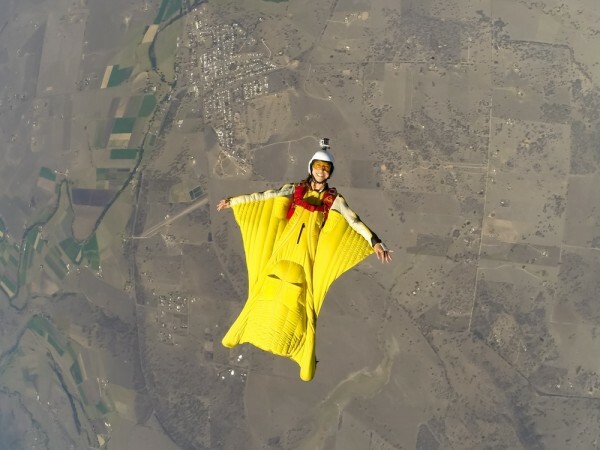 A wingsuit is a jumpsuit spanning nylon between arms and legs to transform the body into a human glider (think: flying squirrel). Eric taught me how to use one, igniting a shared passion. We spent weekends at the drop zone chasing clouds and holding hands. Sometimes at the end of a day we would sit at the end of the runway, tracing its cracks, philosophizing as we took the world apart and put it back together. We knew what we did carried risk, and we talked about what would happen if one of us died. It was a Sunday morning when I got the call. Eric had made a small mistake on a high-speed landing and the error had, as he once phrased it, “cascaded into eternity.” All of the matter in the universe is sucked into the moment when the consequences of risk become real. The impossible density of it squeezed everything alive inside of me into pulpy deadness. As a skydiver, I had learned to handle situations most people can’t deal with. Even beyond the sport we both loved, Eric had never shied away from bearing responsibility for others, even when doing so was painful. And so I wrapped his strength and conviction around my own and refused to give up on our—now my—life. Four months passed before I was ready to try skydiving again. I didn’t want to let fear of the unknown—how would it feel to fly again without him?—dictate whether I quit. On my first jump back, I wept in the plane and performed the ritual of exiting into the blue. When the time came, it took everything I had to pull my parachute and choose life. I saw him next to me, flying on, and understood that I could not follow. Yet there was so much joy in sharing the flight. Eight months later, I took some of his ashes up on a wingsuit jump and set them free. Achingly, I dismantled the dream life I had built and returned to the United States, where I felt I had the greatest chance at finding another open door. 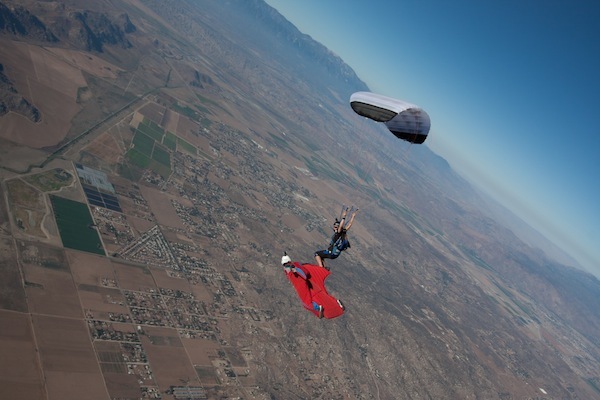 I spend a lot of my life in the air now, teaching people to fly and organizing world record wingsuit formations. I survived the transitions from sensory-overloaded novice to lifelong student to teacher and leader. On this path, Eric became part of me. I continue to bear witness to small human errors that take my friends away. But like any other risk-embracing journey, there are trade-offs that make the seemingly perpetual loss worth it. I have become part of a family made up of people from all walks of life. We are joined by our desire to experience the space between sky and ground, using the very force that pulls us down to help us fly. My hope is that our resilience, and the triumphs of our explorations, will inspire all who dream of freedom in any form to take the first step. is a professional skydiver, wingsuit flyer, and chronicler of gravity-powered adventures. More of her writing can be found at www.tayaweiss.com. Lead photo courtesy of Noah Bahnson. Interior photos courtesy of Roger Hugelshofer and Will Kitto.